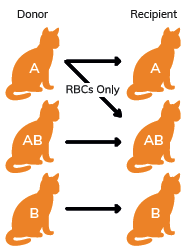 On each strip, we have incorporated a specific Feline anti-globulin reagent that will detect the presence of immunoglobulins (IgG & IgM) and/or C3 components binding to the red blood cells surface. In pre-transfusion compatibility testing, a positive XM result between donor and recipient will indicate the presence of alloantibodies. These same strips will also give you the blood groups of both donor and recipient. On each strip, we have incorporated 2 specific monoclonal antibodies: Anti-A antibody and Anti-B antibody that will retain positive antigens to give you a reliable blood typing. 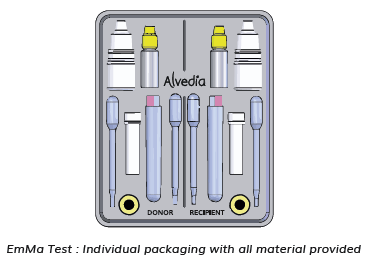 The innovative packaging is based on a bench-top workstation for facilitating the test procedure. All material is provided in an individual packaging. The test procedure can be done in 20 minutes. Results can be interpreted immediately by all operators. The test requires a centrifuge for the washing procedure only. Our NEW Feline XM Test has been validated on a total of 231 cats (216 A blood type cats, 12 B blood type cats and 3 AB blood type cats) It has been performed a total of 1232 Feline XM Tests using the EmMa Test compared with the classical agglutination technology. The EmMa test will show more incompatibilities than the agglutination technology due to the fact that our technology is more sensitive with the use of a Feline Anti-globulin. It will detect low affinity or low titter allo-antibodies. In rare cases of positive XM only, the agglutination is too strong and blood typing will not show up on the EmMa Test (approximately 2% of the results). Blood typing will have to be done separately but that confirms an incompatible XM.